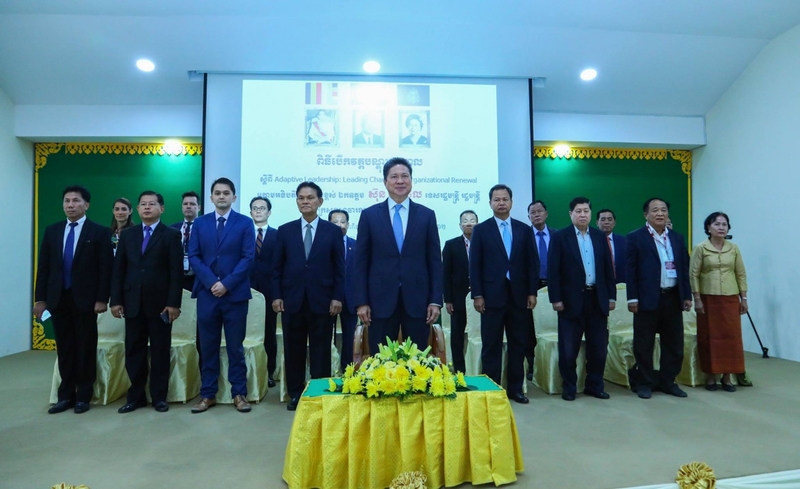 PHNOM PENH, CAMBODIA – H.E Mr. Sun Chanhol, Senior Minister of Cambodia’s Ministry of Public Works and Transport, was all praise for the Center for Asia Leadership’s Adaptive Leadership training on Feb. 11 to 16 for his office’s government officials. “…This workshop represents a rare opportunity for professional and personal growth and gives you the chance to learn the skill sets necessary to make a positive contribution towards the growth of both our Ministry and our country,” he said in a message to the program participants. The first run of the program for Cambodian Ministry of Public Works and Transport (MPWT) officials was held in Phnom Penh, Cambodia, on Feb. 11 to 13, with the second one on Feb. 14 to 16 in Preah Sihanouk Province, Cambodia. CALI President and Co-founder Samuel Kim, together with CALI Teaching Fellows Helen van Baal, a strategic designer and design thinking expert, and Jeffrey Lamb, a senior consultant to the UNDP and the World Bank, spearheaded the three-day training program specifically customized for senior and mid-managers in the public sector. Highlighting frameworks and tools taught at the Harvard Business School and the Harvard Kennedy School of Government, the 15 training sessions focused on a variety of topics such as “Why is Adaptive Leadership Important to Us Today?” and “Critical Factors to Adaptive Leadership in Practice,” and featured interactive workshops and case discussions. The Teaching Fellows also shared their personal leadership stories during Smart Talks and facilitated group discussions where participants discussed their past or ongoing work and leadership challenges. In closing, the Senior Minister encouraged the participants to take full advantage of the learning commitment they had made. “Beyond these skills, the workshop will give you the ability to reflect on your core values, your life goals, and what your motivation is on taking on a leadership role. You will learn how to develop the capacity for leadership that goes far beyond managerial expertise into the realm of generating creative problem solving,” he added. The organization has worked with and served 36,000 individuals and more than 300 organizations across 72 cities in 32 countries in Asia.